I think that’s about as much as I can cover without giving anything away, so keep an eye out for spoilers after the jump. This issue furthered the idea that there’s something very wrong with the Barry who returned from the speed force — and not just that he has a death touch. Watching him and Iris together, it’s hard to recognize the couple whose love conquered the Anti-Life Equation in Final Crisis. As I said in my initial post, I really appreciated the simplicity of explaining Barry’s absence and return by saying he’d been in the Witness Protection Program. Geoff Johns is often partial to over-complicated explanations — just consider the contortions he went through in Final Crisis: Legion of Three Worlds #3 to explain that Bart was “our” Barry’s grandson while still unloading the Reboot Legion onto an alternate universe so he could establish his favorite Legion as the “real” Legion of Super-Heroes. I’m disappointed to see that they have indeed retconned in that greatest of cliches, a tragic parental death to motivate the hero. It’s shown in more detail here, and even mentioned in last weekend’s Blackest Night #0 (alongside Hal Jordan and Bruce Wayne talking about how their tragic parental deaths motivated them). I do think it makes more sense for Barry’s father to have been wrongly convicted, with Barry determined to prove his innocence, than for him to actually be a murderer. Of course, then there’s the question: just who raised Barry Allen, if his mother was dead and his father was in prison? Given Dr. Alchemy’s cameo in issue #1, and the framed story about Mr. Element’s capture that keeps appearing in Iris’ house, it seems likely that this is intended to be Albert Desmond. When the good side of his personality was in control, he was a friend of Barry Allen’s (he and his wife even attended Barry and Iris’ wedding). It would certainly make sense for him to be a scientist as well. If it is him, I’m worried about his line from issue #1: “I wonder if you remember me — and if you’re still angry about what I did to her.” I have a horrible feeling that they’ve brought back Patty just to retroactively stuff her in the fridge. Let’s face it — she’d be at least the fourth character in this miniseries to be dragged out of limbo only to be summarily killed. The first meeting between Barry and Iris was cute, though I think I prefer the version from The Life Story of the Flash (though now that I think about it, that put a little too much emphasis on the crew cut). I don’t like the timing, though, where it seems that he and Iris hadn’t even gone on a single date at the time he was struck by lightning. Maybe Johns is trying to go for a symmetry where the two most important changes in Barry’s adult life — meeting Iris and becoming the Flash — happened in parallel. So they brought Savitar back to life last issue just so that they could kill a powerful speedster without sacrificing anyone “important.” And this issue they brought back Christina Alexandrova, whose only appearances over the past 10 years were a handful of panels in Salvation Run…just so they could kill a powerful speedster without sacrificing anyone “important.” It’s kind of a cop-out (not that I really wanted them to kill, say, Wally or Jay), but it’s also a let-down because these characters could have been kept around for future stories. Savitar could have been the major villain in another epic. Christina has a personal grudge against Wally — which, I suppose is the reason she’s been moved off the table. It just seems such a waste. Finally, there’s the Black Flash: the manifestation of death as it appears to speedsters, or perhaps the manifestation of the deadly aspects of the speed force, depending on perspective. It seemed obvious last issue that they were setting Barry up as the new Black Flash — so obvious that I figured they couldn’t possibly be going there. But they not only made it clear, they put it in dialog and gave the Black Flash a logo. And changed the color of Barry’s costume. Just in case you missed one of the other 37 clues. The idea that the Black Flash is an actual person transformed into a harbinger of death bothers me. I always saw the appearance as essentially being a matter of perception: Speedsters of the late 20th/early 21st century would think of the Flash as a symbol of super-speed, so they’d see death as a dark, decaying Flash. If Max Mercury had encountered it in his youth, he would have seen something else. Setting it up as (essentially) a job makes me wonder who the previous Black Flash was. As with the previous issue, I liked it when I first read it, but the more I think about it, the more some elements bother me. Isn’t it ironic that Flash: Rebirth seems to be wallowing in death? Who is to say that the charred body in the field isnt in fact Barry Allen at the end of his own timeline when he resumes his role as Black Flash? He is the beginning and the end – we just saw the end before the beginning… if he finds out he will inevitably have to become Black Flash again it might compel him to do what he can while he can. Just thought about something… in Rogue war when Zoom and Thawne pulled Wally through time there is a quote plucked from time where a cop says something like “sorry son, youre father’s a killer.” Perhaps planted for Rebirth? Hmm, I like that explanation! As for the “Rogue War” flashback, I just checked, and everything else in there is a flashback to key moments in Hunter Zolomon’s life — and his father is in fact a killer. The similarity to Zoom’s origin is one thing that makes this background for Barry even more annoying than it would otherwise. I predict… Max Mercury will take over the Black Flash mantle. I take it back about the Black Flash thing…I seem to remember him really liking long walks through corn fields near Barry’s birthplace. …And he had become very distant lately. I think the dialogue on page one in Gorilla city sums it up best. I’ve been holding it in since I first saw the cover preview but…. what is with Barry’s mile long abdomen? That whole area of his body as well as the lightning belt just looks bizarre. Similarly on cover #3, Superman’s superundies look like a squirrel lives above his left leg. Great art otherwise. Hmm, I was thinking Al Desmond would have something to do with Nora Allen’s death (maybe helping to cover it up in the forensics lab), but Patty Spivot would make more sense. I hope that doesn’t happen either. Is it remotely possible this isn’t Barry? I know they pulled it in The return of Barry Allen (not to mention Swamp Thing), but what if this is all a swerve, and Barry hasn’t actually come back yet? There’s at least one line from Iris basically refusing any attempts to absolutely verify it’s Barry. What if this is a ball of Speed force energy who’s absorbed the thoughts of SEVERAL speedsters? Has there been any verification that the past of Barry Allen is in fact the truth? Maybe barry will show up in an issue or two, to help sheperd this mistake back to te speedforce? Just random imaginings, fueled by a desire to make this story better. It’s Barry. With so many failed relaunches up to this point, DC really can’t afford to play more games with readership. That could kill the franchise for a few years. So yeah, Barry. But a slightly askew take on Barry. He’s going through a pretty significant transformation. As with the first issue, I came out of it without a strong opinion as to it being good or bad. There seem to be equal amounts of good ideas and ones that irk me; but, that’s to be expected in any new book. However, I finally figured out the thing that really bothers me about Rebirth after reading yesterday’s issue: nothing in this mini-series feels real. 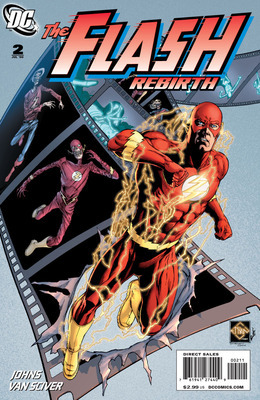 To elaborate: Flash: Rebirth is not the new ongoing Flash series. We don’t know what that will be yet or who it will focus on; but, theoretically, it will be set up by the end of this mini-series. While Barry seems to be the Black Flash now, it’s hard to believe that DC brought him back with so much hullaballoo to just make him the Black Flash. This makes me feel like nothing before issue number 5 or 6 of this mini-series doesn’t really matter. Normally, I’d be rapt in suspense, eagerly awaiting what will happen to the Scarlet Speedster next. However, it’s been three real world years since Wally’s book was originally cancelled. In those three years, we’ve had two Flashes “die,” three Flashes come back to life, three relaunches, power issues,identity issues, domestic issues, employment issues, and that’s before one looks at the creative team/direction issues. I’m exhausted. It’d be one thing if the stories had been great this whole time; but, they haven’t. I’d really like to get back to the business of a guy in a red suit running fast and fighting crime. I can deal with whomever ends up in the suit and his/her secret identity issues. But, let’s get on with it already. This Rebirth story feels like an unnecessary middle step before getting back to the “real” Flash book. This might be more of a reflection on how things have been repeatedly shaken up over the last three years. It makes me wonder if this relaunch will actually stick or if DC will get scared again about sales and throw everything out the window once more. Wow, this post got long and whiny. Sorry! I think I’ve had this pent up a little too long. Am I the only one who didn’t pick up on the Barry = Black Flash thing until the reveal? Hey, made for a good cliffhanger for me. Still though, I hate Barry’s new characterization. He’s way too solemn and standoffish, not to mention his horribly unnecessary new backstory. At least Bart’s back to his old fun self. With what Lia said up there about desmond being connected to noras death. Thats not the philosophers stone in the unidentified bag with the nora allen cold case stuff is it? But it seems a little early for him to have had it. .-= Jason West’s latest blog post: Life, the Universe, and Everything… =-. @awkwardpenguin: That flashback *would* be too early for Desmond to have the Philosopher’s Stone, but that flashback is also too early for Capt Frye or Patty Spivot to be around, so obviously Johns is playing around with continuity (or things aren’t as they seem — false memories or false flashbacks, perhaps). I agree with Yossarian1373. None of what is going on matters in the long run. It is starting to feel like The Flash is a labor of love for me. It’s tedious and laborious to read, and in the long run I know they are just going to make some drastic change. Each issue doesn’t have anything particularly exciting or intriguing. I long for the days of Wally West in issues 180-210. I think the story will have long term ramifications to the Flash mythos but the pacing of this particular story is dependent on the story arc. As Kelson points out – much of it has focused on death so far with just enough room for the re-aquianting with Barry and several mystery setups. I think it will be a good story when the whole picture is viewable but my fear is that the long term ramifications will leave Barry as the stereo-typical hardboiled TV crime drama cop. Beleive it or not, before the the trial… and before the post mortem re-imagining of Barry as a saint/hardass there was fun and wonder in being a superhero within the pages of Barry Allen’s Flash. Some of that sense of humor seems to have been picked up by Bart. I don’t think any comic has to be any one thing – and they certainly don’t write it just for me but it might get a little tedious for my taste if an ongoing series requires some earth shattering drama every 6 issues followed by a DC-wide event. To their credit some of the historical references have shown the spirit of that fun. @Vinnie: reminds me a bit of Reign of the Supermen, actually. @Yossarian1373: Yeah, I doubt he’ll stay the Black Flash…or if he does, he’ll learn to control its effects. And believe me, you’re not the only one burnt out on relaunches! @ Aleclom bout Bart: Well, not really. Looking back at Rebirth #1 (yea, I know, old news), I find it disturbing that Bart’s pissed at Barry’s return. I mean, if I’m not wrong, Bart loved Barry. So Max didn’t get out, shouldn’t he still be happy out his grandpa? Two issues down, and I’m underwhelmed. So far, Johns hasn’t given me a SINGLE reason for Barry’s return. I think I’m MORE pissed that Wally and his cast is uncerimoniously dumped. Savitar was a brilliant creation, and ever since the end of ‘Dead Heat’ have begged for a return bout between him and Wally. Unfortunately, Johns has taken the ‘baby AND bathwater’ approach and wasted a character with endless potential to leand gravatis to a rather uninteresting situation. I’ll continue with this book and hope for the best. But if the first two issues are any indication, I find the return of Barry Allen not only unnecessary, but more worrying, uninteresting. @Rob: Sadly, I feel like “baby and the bathwater” is DC’s standard approach these days. There’s another, geekier problem with Henry Allen going to jail and dying there — it pretty much destroys the premise of Johns’s own “Rogue War” and Identity Crisis tie-in storylines, and with them much about the rogues in general, by making the 1970s “Top in Henry Allen’s body” story impossible. Along similar lines…wasn’t it the Black Racer, nt the Black Flash, that they used against Darkseid? Or are they the same being now? If so, the Racer’s always had a human host — Willie Lincoln, from Kirby’s introduction of the character, would be the best known. I thought it was a simple way of adding to the character (he’s unprepared from being so focused) while giving a nod to the history.